BEAVER CREEK, Colorado – Earlier this week, Ani DiFranco was taking a short break with friends in Canada before her upcoming shows in Colorado. Apologizing for delaying a phone interview for a couple of minutes, she said she was busy brushing her 3-year-old daughter’s hair. That’s right. The iconic folk singer from Buffalo, New York, who at the age of 19 shaved her head, started her own record label (Righteous Babe) and moved to New York City (not necessarily in that order) turns 40 next month, is married to the father of her child and the guy who helped produce her last two records – Mike Napolitano – and is pretty happy with her life. “I’m sorry, I just had to finish brushing my daughter’s hair or else I would never get to do it again. She would run off and leave me forever and then, you know, the dreadlocks are instant,” DiFranco said, going on to admit that dreadlocks (which she herself has sported over the years) wouldn’t be all that bad. DiFranco’s daughter, Petah Lucia DiFranco Napolitano, has a different life than most toddlers. She accompanies her mother almost constantly, which means she abides more to the rock-n-roll clock than Mother Goose’s. 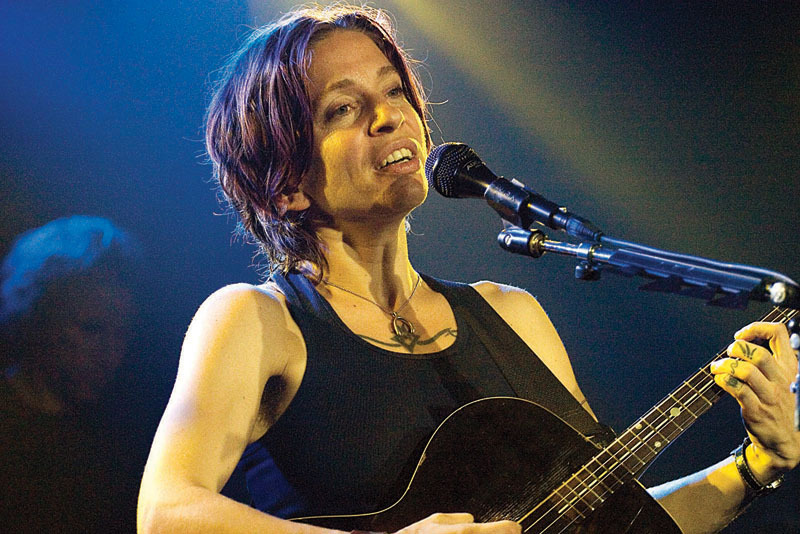 Although DiFranco is content with her personal life, don’t go thinking she’s getting soft. With her newfound inner calm, her eye for the injustices of the world has only become sharper. Over 20 years and 20 studio albums, DiFranco has covered the gamut of relationships with men and women, social and political strife, civil rights and abuses, but she is breaking out the big guns (again) for her next record. Her songs have historically painted colorful and poetic pictures of the issues. She has written about “being escorted through the doors of a clinic by a man in a bulletproof vest,” and outlined the irony of a doctor being shot by a militant anti-abortionist (“a bullet ensuring the right to life whizzed past his kid and his wife and knocked his glasses right off of his face”) but has never actually uttered the word abortion in a song. Until now. She describes a new song, “Amendment,” as “a direct proposal for a constitutional amendment” along the lines of the Equal Rights Amendment that guarantees equal rights for men and women under federal law but which is still not part of the U.S. Constitution. Also, the oil spill song is in its final stage of completion. At the beginning of the summer, DiFranco started a journal documenting her thoughts on the spill and the pages are now (pun intended) overflowing. Most long-time DiFranco fans will be thrilled about the fresh fire behind the new record, but DiFranco knows by now that she can never please everyone. One thing that has heartened DiFranco recently is being told by other musicians that her boldness – always putting her neck on the line and sticking to her convictions at the risk of having her throat slashed – has inspired them to take more risks in their own work. Shauna Farnell is a freelance writer based in Vail. She can be reached at shaunafarnell@hotmail.com.